First: many thanks to Jim Austin and John Page for letting me use their photographs. In the fantasy-land of California, between the Great Bay and the Hills, there lies Oakland, and in it the Shangri-La of shops, to my mind: Alchemy Metalworks, where James Austin grapples with metal and the higher meaning of materiality. 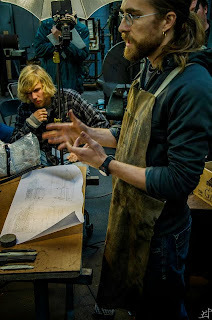 It was here, in his incredible shop-creation and presence, along with that of Jeff Pringle, where I first witnessed serious and passionate craftsmanship that has affected the whole course of my life since. My feet having tread the pathways of the space many times, my eyes having gazed upward so many hours at the dust-motes drifting wearily in the light-shafts of the ceiling windows, for all the world like a forest of cement and steel, chipped and ancient paint replacing bark, but clean in the way a forest is before autumn. It was in this familiar place, where I first discovered the many-fold transformation of elements within my power, one day in October, a number of individuals from all over the world gathered to feel the same thing in their own way and communicate it through a common tongue. 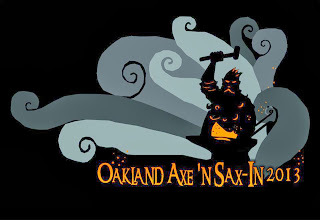 Though I wax poetic, the Oakland Axe n’ Sax-In 2013 was a specific enough event on paper. Few will argue that Jim Austin’s work in re-creating the Viking-period axe-forging process is unparalleled in its results, based only on his examination and rumination on original artifacts with Jeff Pringle, and his experience with traditional forging techniques. It was only fitting that he host the event and hold forth on the subject into which he has such respectable insight. 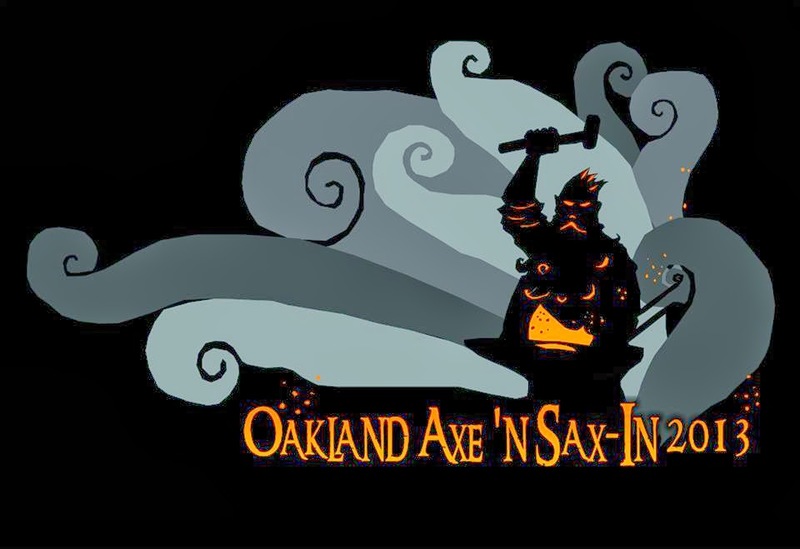 idea was a celebration of the making of the two most unique, fascinating, and beautiful feats of Iron-Age Germanic metalwork: the axe and the sax. 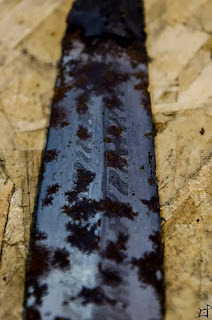 As for the other focus of the event, I have spent much time meditating on the sax and its implications as an object in Iron-Age Germanic society, but the bottom line is that the ubiquitous freeman’s war-knife is basically a simple, wonderful, and broad playground for discovering historical pattern-welding techniques, experimenting with historical blade steels, and familiarizing oneself with historical forging geometry, finish, and much more. That’s why sax-forging is such a rich and exciting field for me, and is a great skill-builder with a higher success rate than sword-forging, at least where I am. So the idea for the whole event was that a number of presenters, experts in their creative areas from Canada, Europe, and the whole US, would lecture/present/demonstrate for the attendees something they could get from nowhere else. 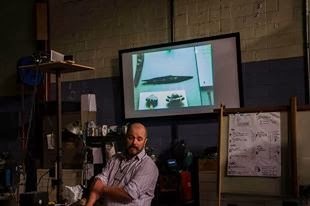 The first to present was Owen Bush, with whom I first learned pattern-welding techniques, an Englishman and peerless blade-maker, whose recent years of research have focused in great part on the historical pattern-welded sax, primarily in his native Anglo-Saxon broken-back style. His presentation was in two parts: in the first he want over basic sax recognition skills, and the history of his own work on it, and introduced a particularly interesting original piece in the British Museum he aimed to loosely re-create. The second half of his demonstration (on the final day) was forging this technically difficult and creatively challenging composite piece before our enchanted eyes. The next presenter on the list was Petr Floriánek, that library of historical art styles and their material contexts, again someone I have visited abroad. 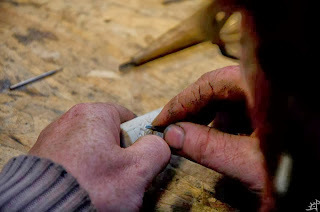 His scholarship focused on Iron-Age Germanic ornament and how it was traditionally applied to historical media, such as the carving, chipping, and scraping of antler and wood, the pressing of foil into dies to make pressblech, engraving, and much more. He gave a chronological run-down of art styles from the beginning of Germanic art to the end of the Viking Age (roughly 300-1100 CE). 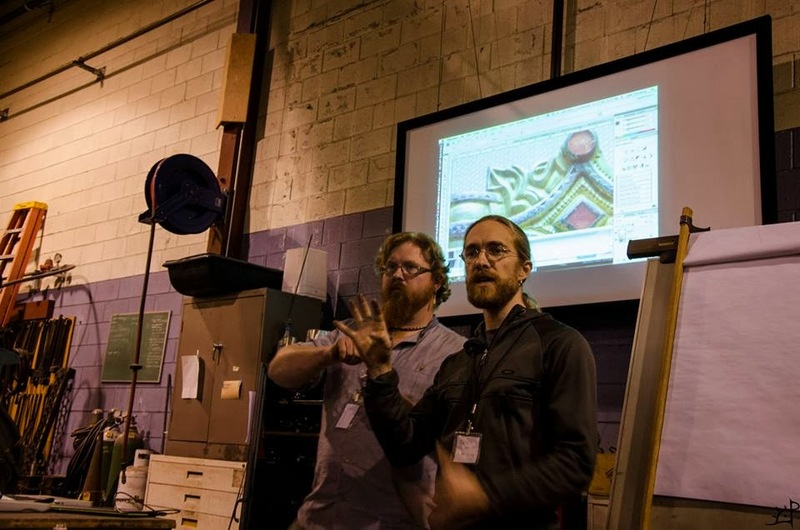 He also tag-teamed a presentation with Jake Powning on “decoding” Germanic abstract ornament, revealing ways in which one can scan for clues, for familiar shapes, that reveal the form of the whole hidden within the flowing lines. One of the most interesting insights he shared was the method of thinking about the abstraction-of-form based ornament as a language, with vocal landmarks you can watch out for, just like in the structure of speech, from which you can make constructional headway to learn it. 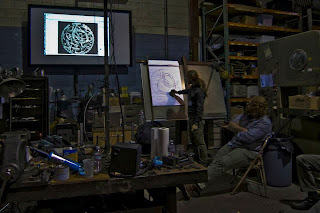 For example, he pointed out similar portrayals of eyes, jaws, and hip joints in earlier art, and the application of tongues, tendrils, and other extremities in later art, and how their integration is the same but the styles themselves have completely different soundscapes, so to speak. There was also Jeff Pringle, whose extensive collection and long study of individual artifacts for personal examination and discovery has led to a truly deep insight into the intangible "authenticity" aspect, which is well-reflected in his own work. He spoke of how we examine original artifacts; what they tell us and what they don't tell us. A piece tells us exactly what what the product of a smith's work was. A corpus of work tells us what norms, trends, and anomalies existed over a given period or in a given area, provided they have some sort of correlation. But there is more that the objects imply that is less straightforward. 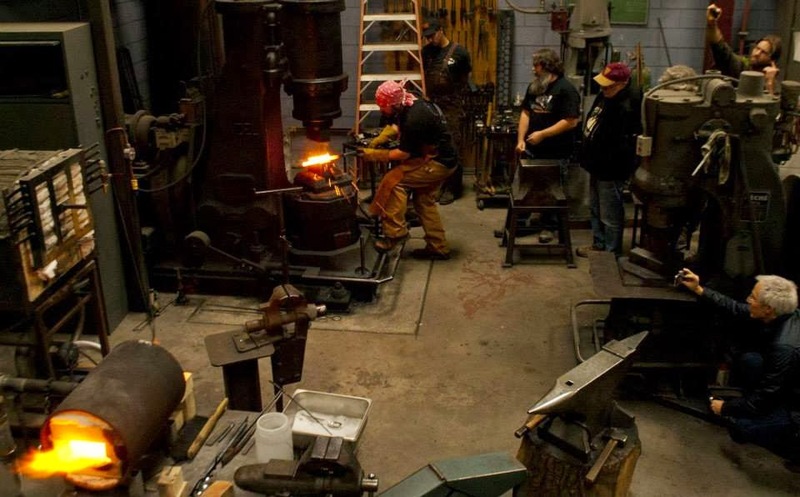 For instance, types and amounts of material tell what was scarce or difficult to make, like ratio or iron to steel. Overall, we can surmise that in the past material culture we were concerned with, labor was very cheap and materials were very expensive. 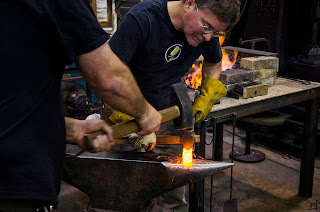 As someone who has witness his share of iron-making (with Jeff), I can tell you that even for the most experienced, it's a laborious and expensive process. With this in mind about the material culture at hand, Jeff went on to address the research of originals: there are archaeological reports, many made between 1890 and 1950, published in Danish or German and accompanied by line drawings of varying accuracy. These can be helpful or misleading when you are researching an object. Another important concept Jeff covered was this: original artifacts exude a power over us, because they are material, empirical evidence of past persons, with whom we as smiths or makers or anyone who uses tools or as humans in general have a connection, which is alive in the piece, in the material, which has not changed since we first learned to work it. Finally, he addressed the issue of blade culture and continuity, which is an important thing to consider. He compared Japan, where swords and their making have remained culturally important continuously, as opposed to their complete oblivion in the West. But there is an in-between: he had a beautiful pattern-welded spear in a very Viking-style, expertly made and highly functional with visible but cosmetic imperfections. It was made in the Philippines in the past century. Just like the living tradition of bloomery smelting in western Africa, these new but undeniably original artifacts are miraculous windows to the past, even though they were made a thousand years and thousands of miles from our area of study. That is the beautiful universality of iron. Jake Powning contributed to Petr's first presentation, but had two of his own to execute. His first was a deeply needed and captivating examination of, in his own words, "the world the axe and sax came from". In my work, I try to remember that what I'm making is not strictly mine; it belongs to another time, another place, and what I'm trying to make is something that would have been made by someone with an entirely different mindset, an entirely different worldview. He shed light on who would have used axes and saxes, by surveying what we know about class and weapon ownership from legal documents, literary references, and grave excavations. He questioned our perceptions about warrior status, addressing the Anglo-Saxon linguistic distinction between "wæpnman" and "wīfman" (weapon-person and weaving-person, the latter which gave us the words "wife" and "woman"), which was a genderless dichotomy (man: person, cf. 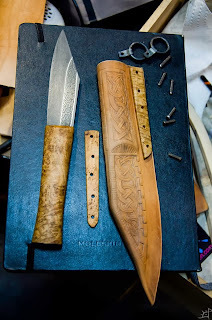 modern German man: one), the fact that swords, axes, and saxes are present in the graves of both men and women, just as with what is called a "weaving-sword", a wooden or bone slat for ramming down the weft into the warp. He talked about who the smith might have been in Germanic society, respected for his skill but feared for his power, valued but stigmatized. Jake went on to regale us with his own re-tellings of the Lay of Volund and the story of Sindri and Brokk, smithing tales both, and laid into us with magical storytelling, capped off with his own breathtaking illustrations. It was transformative. 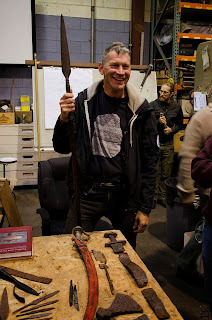 He continued with the tooling of the leather scabbard of a beautiful little broken-back seax he forged, for use in his demo and then to auction off for the benefit of the event! There were three more demos: the forging demonstrations of Jim Austin and Owen Bush, an axe and a sax, respectively, and the antler handle-carving of Petr Floriánek. The impact of witnessing the making of these three master craftspeople is honestly too complex to explain here, and I will let pictures speak in what two-dimensional way they can.